The all-new BMW M5 is the latest in a long line of super-saloons. Jack Evans heads to Portugal to see how things have moved on. So here it is – the all-new BMW M5. Following in the footsteps of some of the best-regarded super-saloons ever made, this latest four-door powerhouse has got a tougher job than ever to remain top of the pile thanks to some hugely capable rivals. Utilising the very latest engine technology, it’s also the first M5 to feature all-wheel-drive, as well as a host of other features designed to make it sharper and more capable than ever before. There’s a lot going on here. The new BMW M5 makes use of a 4.4-litre V8 turbocharged engine as well as that all-important all-wheel-drive system. The latter is one of the biggest changes to the M5’s layout, with most M-cars traditionally powering the rear wheels only. That said, this new car can still be locked off to rear-wheel-drive only – so purists need not be too aghast. Not only this, but this sixth-generation car is lighter than ever before too, making use of carbon-fibre reinforced plastic to keep its overall weight down. 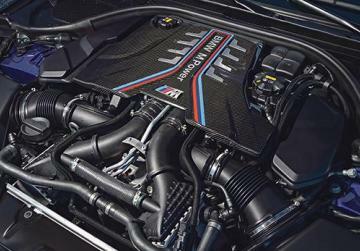 The new BMW M5 uses a 4.4-litre turbocharged V8 engine to power all four wheels. Here, it produces 592bhp and 750Nm of torque, allowing it to hit 60mph in 3.2 seconds before reaching an electronically limited 155mph top speed. All that fury is sent to the wheels via an eight-speed Steptronic transmission. 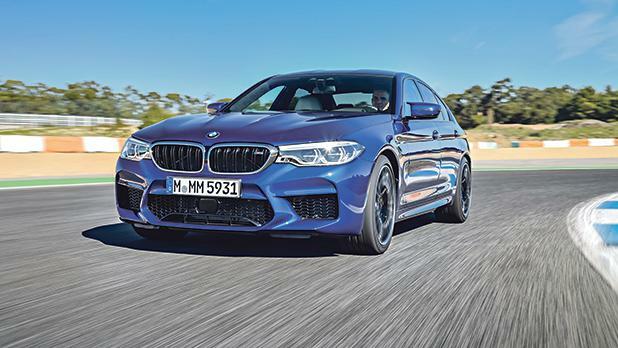 BMW claims that the M5 will do 26.9mpg on a combined cycle, while emitting 241g/km CO2 – so there is still some degree of sense despite the performance madness. BMW M5s of old had a reputation for being somewhat spiky to drive. This latest one, with its all-wheel-drive technology, has been designed to offer a little more traction – and it’s well and truly achieved this. Despite packing close to 600bhp, the M5 rarely feels out of control, instead offering a lot of balance and adjustability. The biggest factor in this is that all-wheel-drive system. There’s no doubting the car’s rear-drive-bias; when the system is set to allow a certain amount of slip, the M5 will fall into delightful mini-drifts, sliding you through corners without ever feeling like it’s going to spin around and bite you. Turn all the systems back on, and it transforms into a point-to-point weapon with all of the traction you could want. Then there’s the engine. Anybody who doubted turbocharged engines in performance cars needs to experience the way the M5’s V8 deploys its power. There’s no lag to speak of, just shove throughout the rev range. Of course, lower down is where you notice the power the most and any press of the throttle is accompanied by a deep, mechanical bellow. The steering also has a decent weight to it, though it feels most capable in sport mode – the middle of the three. Comfort feels too light, while sport plus is granite-heavy. The middle ground, unsurprisingly, is the best bet. 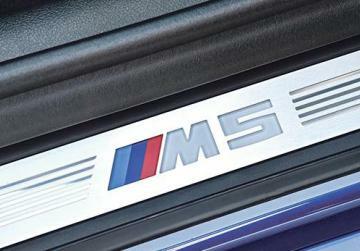 The M5 exudes all of the classic styling that we’ve come to expect from big, powerful M-cars. It’s certainly not as wild as the current-generation M3, but it still looks special. 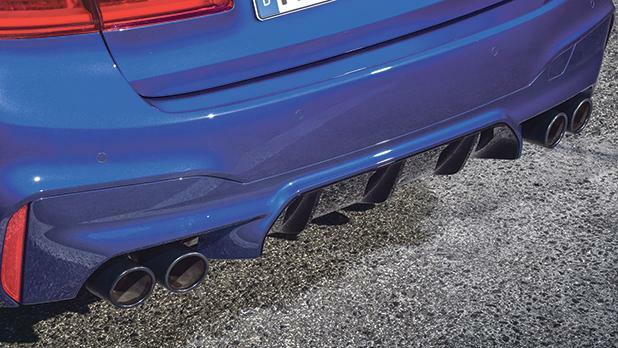 At the rear, four exhaust pipes to give some hint of the car’s performance, as do the gills at the side of the car, but all in all it’s still instantly recognisable as a BMW saloon – and that’s no bad thing at all. M-cars aren’t meant to be shouty and brash in terms of exterior styling, as they let their performance do the talking – and that’s just the case here. The interior of the M5 has a solidly basing as it uses the vast majority of components from the standard, but excellent, 5 Series cabin. That means you still get an infotainment system which is simple and easy to operate, as well great build quality and good materials. The M5 builds on this with additional ‘sporting’ touches, such as carbon-fibre finishers for the dashboard. The biggest changes come in the form of driving mode selectors. 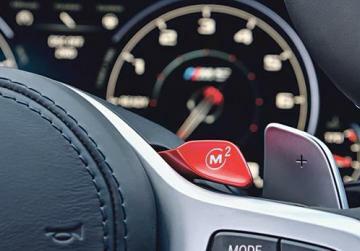 Two red ‘M’ buttons sit at either side of the steering wheel, and allow you to customise the suspension, steering and engine responsiveness to one of three modes. There’s also the drivelogic selector, now found on the top of the gear stick, which controls how quickly and sharply the car changes gear. Of course, as it’s based on a standard 5 Series saloon, the M5 remains hugely practical. There’s loads of space for both sat up front, while rear seat legroom is excellent too. The cabin, as a whole, feels special as well as comfortable – and this makes it ideal for those who are planning to undertake longer journeys but still want plenty of ‘star’ factor. You’d expect any high-powered executive saloon to pack a lot of toys and, thankfully, the M5 delivers in this respect. Standard equipment includes 20-inch alloy wheels, adaptive LED headlights and dynamic LED brake lights on the outside, with BMW’s professional media system, 10.25-inch colour display and front heated seats just a variety of the long list of included technology for the inside. Of course, being a BMW there’s still a long list of options to choose from. Highlights include ceramic brakes, a sports exhaust system and a full carbon engine cover. The M5 certainly came into this world with a lot of competition. However, thanks to better all-round capability than ever before, it’s likely to come out on top when it goes on sale next year. It’s relatively expensive, but given the sheer amount of technology and performance on board, it feels more than worth the money.